Eds Meirotti, M & Masterson, G, EISA 2018 (papers presented at the 12th Annual Symposium). The state capture that has played out recently in South Africa, in conjunction with the transitional status of many African countries, raises the question of whether these countries, too, are experiencing some form of state capture and what lessons can be learned to safeguard transitional democracies in the region? 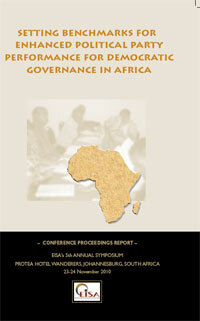 Checks and balances: African constitutions and democracy in the 21st century, G Masterson and M Meirotti (eds), EISA 2017 (papers presented at the 10th Annual Symposium). In this edited volume, some of Africa's leading academics seek to answer questions such as: If constitutional changes continue to be elite driven processes - excluding citizens - can constitutions ever truly be 'living documents' providing the foundations to build and consolidate democratic norms and institutions in Africa? Ed Astrid Evrensel, EISA 2010. Chronicles contemporary trends and examines electoral conflicts and the way in which various national, regional, and international players have tried to resolve them. 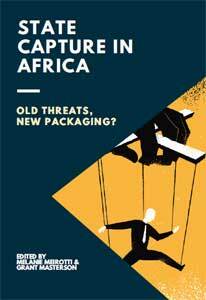 Includes detailed case studies on Kenya, Lesotho, Nigeria, Tanzania and Zimbabwe. This volume of essays from leading civil society and governance experts from across the African continent looks at the critical role of civil society in the APRM, and draws lessons on how to both improve the engagement of civil society in the APRM, as well indicate how the APRM might better be integrated into the activities of organisations and communities striving to improve the quality of governance and development in African states. This volume represents a modest contribution to the policy and academic discourse on the role of the state in democracy and development in Africa, paying particular attention to the state's role in the process of eradicating poverty. The book itself is a culmination of a dialogue process involving various stakeholder it also interrogates the issue that the African state was expected to play a more robust and interventionist role in the development process and inculcating a culture of democrary. The book posed two daunting tests. 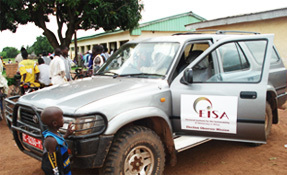 The first arose from the wide scope of EISA's work and its regional expansion. 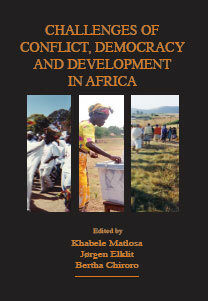 Challenges of Conflict, Democracy and Development in Africa, Khabele Matlosa, Jørgen Elklit and Bertha Chiroro (eds) 2007. The overall aim of this volume is to contribute to the on-going academic and policy discourse on the interface between governance, democratisation, security and development in Africa'. The volume itself ia a culmination of a dialogue process involving various stakeholders during the inaugural 2006 EISA annual symposium held in Johannesburg, and provides an overview and analysis of wide-ranging and comparative case studies. The Politics of Party Coalitions in Africa, Denis Kadima (ed) 2006. Authors document, analyse and explain various aspects of the coalition process as it has played itself out in Kenya, Malawi, Mauritius, Mozambique and South Africa. The insights from the survey conducted on the pre-polling day, 1st June 1999, are presented in a commentary on the character of party activity during the election campaign. Unusual for a new democracy, the parties embody a relatively well institutionalised political culture. The second essay considers voters' perceptions after casting their ballots, about integrity of the electoral process. Local levels of trust and confidence in the authorities are evaluated in the light of international experience. CSOs contribution to democratic electoral process: The challenge to civil society organisations in contributing to the consolidation and promotion of the democratic electoral process, 3 - 4 March 2004, Johannesburg Rosebank Hotel. Sub-saharan Africa Workshop-Non-governmental process for the community of democracies, 2004. Participation of Youth in Local Government Elections: Roundtable Report, Johannesburg, 2000. Order publication. Electoral Systems Roundtable, Cape Town, 1998. Order publication. Roundtable Proceedings on Designing Electoral Systems, 1996. Order publication. Putting Women in Power: Free and Fair Elections: Report, Julie Ballington and Bob Jones, 1999. Order publication. 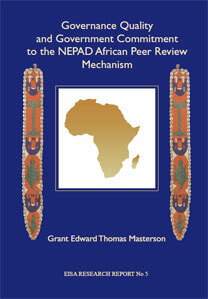 Governance Quality and Government Commitment to the NEPAD African Peer Review Mechanism, Grant Edward Thomas Masterson, 2004. Aimed at empowering CSOs with key information required, including conducting parallel vote tabulation. Aims to enhance political parties knowledge and skills on how to participate effectively in the democratisation project. This handbook therefore contains comprehensive and valuable information pertaining to political parties. While much effort has gone into producing it, this handbook is only intended to be a tool from which training manuals and presentations can be developed.